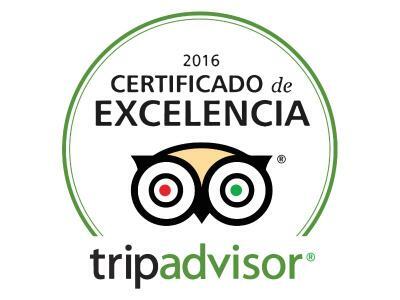 Lock in a great price for Hacienda Uxmal Plantation & Museum – rated 8.9 by recent guests! Beautiful pool, large rooms with high ceilings, lovely veranda and a perfect place to stay to see the ruins just a 5 min. walk away. The proximity to Uxmal ruins. The absolute comfort of our room. Friendly staffs. 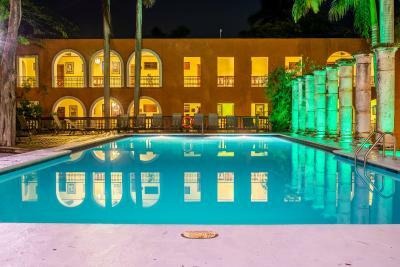 Great hotel and location where is just 10 mins walk to Uxmal. Big and comfortable bedroom with great view. You can walk around the plantation. You can also see and hear many different birds around. There is a nice outdoor pool. It is s very relaxing and pleasant place to stay! Very old school high end hotel. Extensive grounds are remains of original hacienda located across the road from the ruins of uxmal. Lots of coach tours of international tourists stay here for a night while visiting Uxmal. 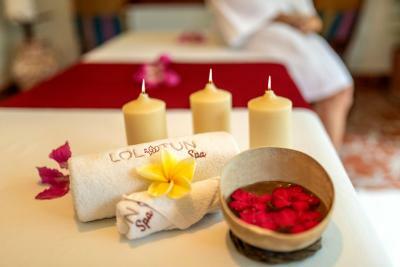 Wonderful skin care treatments at the spa. Old fashioned charming, despite tour groups. Gorgeous historical building with a wide veranda overlooking a well-maintained garden; we loved having coffee in the morning (they were nice enough to provide a coffee maker and new coffee each day) while listening to the birds and rocking in the rocking chairs. Big rooms, lovely pool, and a restaurant and bar on the premises. And just across the street from Uxmal! LOCATION. We stayed there to visit UXMAL by night & day. Staff pleasant who served us "inside menu" around pool. Lovely setting. Reception helped us get driver to Campeche. We’re not accustomed to staying in places like this but we are on a 4 month trip in Mexico and were going from Merida to Campeche and so needed a place close to the ruins of Uxmal. It’s eaily walkable to the ruins, has a wonderful swimming pool, and the rest of the hacienda grounds are beautiful. The staff were welcoming and super attentive to anything you might need. We had the pleasure of having Reina serving us for dinner a couple nights. So charming! Beautiful place full of history. It is very close to Uxmal, so the location is perfect. Staff is super friendly! 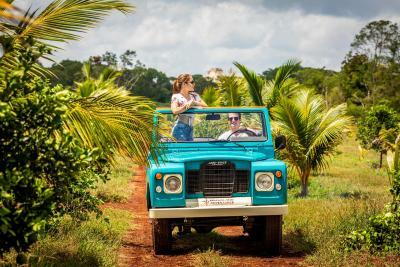 Hacienda Uxmal Plantation & Museum This rating is a reflection of how the property compares to the industry standard when it comes to price, facilities and services available. It's based on a self-evaluation by the property. Use this rating to help choose your stay! Just across the street from the Uxmal Pyramids, and a 40 minutes' drive from Merida. 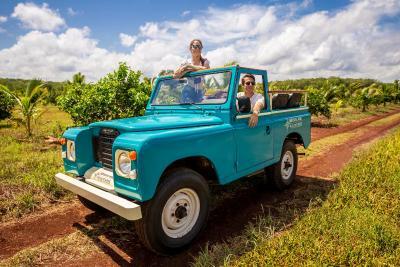 This historic resort offers 2 outdoor pools and a working plantation filled with fruit trees and jogging trails. 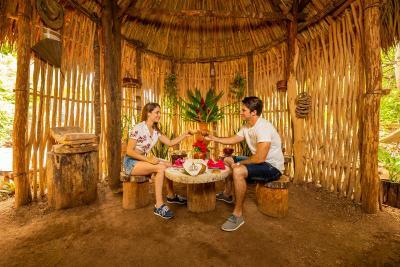 The Uxmal Cacao and Chocolate Museum can be found on site. 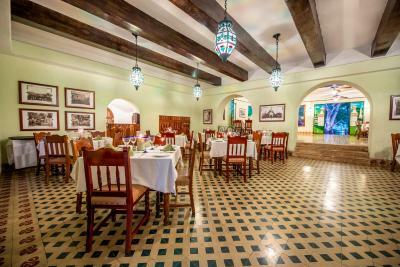 Rooms at Hacienda Uxmal Plantation & Museum feature a blend of traditional Mayan and Spanish décor, and have terraces overlooking the pools and tropical gardens. Some also have plantation views. All rooms offer air conditioning, a ceiling fan, flat-screen satellite TV and a private bathroom. Free Wi-Fi is available in most rooms, terraces and public areas. 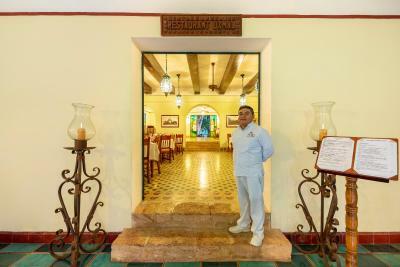 Guests at the Hacienda Uxmal Plantation & Museum can dine at one of 2 restaurants serving Yucatecan and Mayan cuisine. Hacienda Uxmal has hosted many famous guests, including Queen Elizabeth II of England, Prince Rainier of Monaco and Jacqueline Kennedy. It also houses a gallery dedicated to the explorers and archaeologists who discovered and popularized Uxmal. Uxmal Archaeological Park is famous for its spectacular Mayan temples. Located on the Yucatan Peninsula, it is around 37 mi from Manuel Crescencio Rejon Airport. 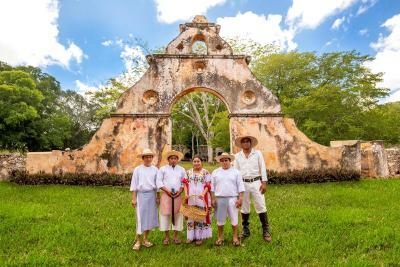 When would you like to stay at Hacienda Uxmal Plantation & Museum? This spacious, air-conditioned room offers views of the gardens and pool. It comes with satellite TV, a coffee-maker and a private bathroom with a hairdryer. This room features a king-size bed or 2 double beds. This spacious, air-conditioned room offers views of the gardens and pool. It comes with satellite TV, a coffee-maker and a private bathroom with a spa bath and a hairdryer. This air-conditioned room offers a terrace with views of the gardens. It comes with satellite TV, a coffee-maker and a private bathroom with a hairdryer. 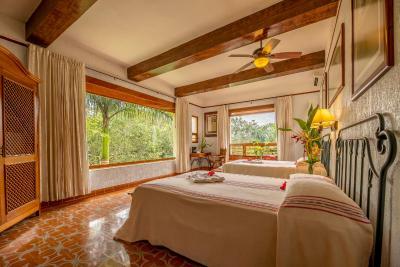 Offering views of the gardens and pool, this spacious suite has Mayan and Spanish-inspired décor. It has 2 double beds and a bathroom with a domed ceiling. Offering views of the gardens and pool, this spacious suite has Mayan and Spanish-inspired décor. It has 1 king-size bed and a bathroom with a domed ceiling. 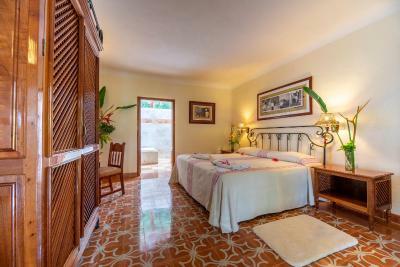 This master suite was named in honor of Queen Elizabeth II of England and HRH Prince Philip of Edinburgh, who stayed there during their visit to Hacienda Uxmal in 1975. Offering a terrace with views of the gardens and pool, this spacious suite has Mayan and Spanish-inspired décor. It has 2 double beds, air conditioning and a coffee maker with Mexican coffee. 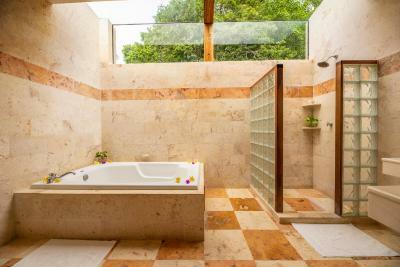 The large bathroom has a spa bath, shower, natural toiletries and a domed glass ceiling which allows you to watch the stars. This suite was named in honor of Jacqueline Kennedy Onassis, who stayed there during her 2 visits to Hacienda Uxmal. 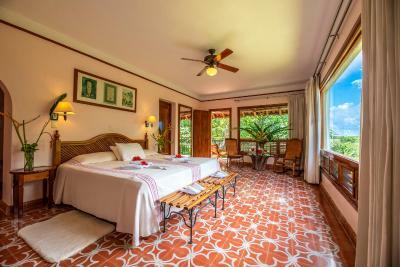 Beautiful connected accommodations, perfect for families with nice views of the gardens and pool. It features Mayan and Spaniard décor. Beautiful connected accommodations with 3 double beds, perfect for families with nice views of the gardens and pool. It features Mayan and Spaniard décor. Beautiful accommodations with nice views of the agave field. It features Mayan and Spaniard décor. 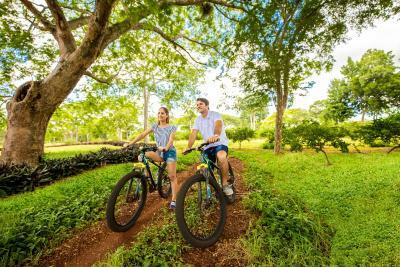 This offer includes a horseback tour of the forest around Chichen Itza, including the Thompson Rejoyada Sinkhole. This suite has a mini-bar, air conditioning and spa bath. 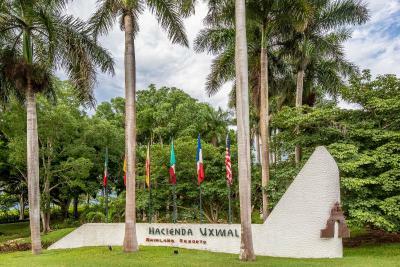 World's First Hotel Hacienda, since 1673 (new building 1955). 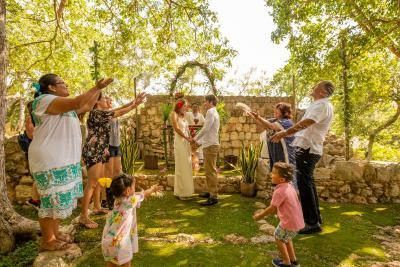 It owned the grounds where the Uxmal Mayan temples are located (adjacent to our Hacienda) for centuries. Over 1,200 acres of grounds, gardens, bicycle & horseback riding trails. 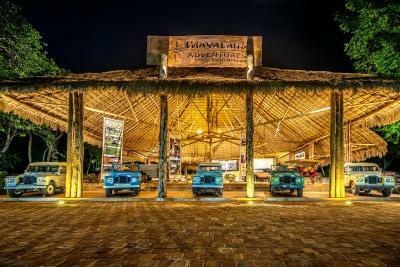 Chocolate Museum & Mayaland Adventures Vintage Car Museum with Classic Land Rovers you may rent & drive anywhere in the Yucatan peninsula, located adjacent to us. 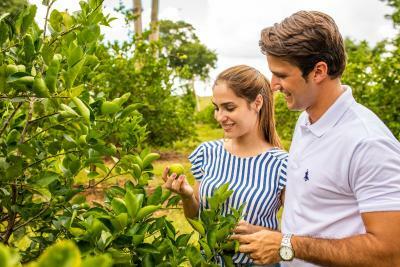 We grow most of our fruit and vegetables on site at our extensive, beautiful, organic plantation. The Hacienda was built by hand in its entirety! All hand made tiles, carpentry, forged iron & furniture. Unique design. Guided tours. A member of Historic Hotels of the World. 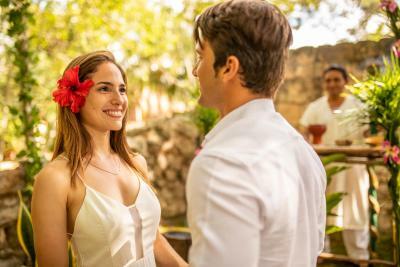 House Rules Hacienda Uxmal Plantation & Museum takes special requests – add in the next step! Hacienda Uxmal Plantation &amp; Museum accepts these cards and reserves the right to temporarily hold an amount prior to arrival. Hacienda Uxmal Plantation & Museum accepts these cards and reserves the right to temporarily hold an amount prior to arrival. 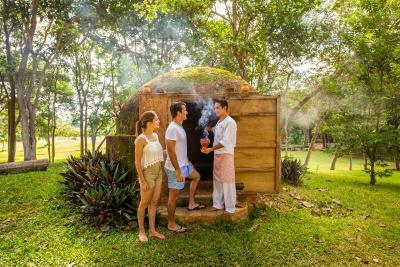 Ideally located 2 minutes by foot from the Uxmal pyramids. Even if the hotel is already some years old, one feels the class and nobility of the house. The classic car landrovers give the hotel also a special atmosphere. We enjoyed every minute there, especially the pool with the antique columns is a dream. Food and staff are also excellent, we can definitely recommend the hotel restaurant for dinner, even it's not cheap. The laundry service was also very good and perfectly on time. Little supermarkets you find in Santa Elena. For breakfast, we can not recommend the "pickled onion". Meals in the restaurant were so so, and one is captive to eat there. The check out was a bit of a gong show. The debit machine wasn’t working. They tried 2 different ones, luckily we had cash so we just paid with that so we could leave. The other downer, which you can’t fault the facility for, the taxes on the room are almost as much as the room rate. Something to be aware of. Great location. A short walk to Uxmal. Great margaritas and guacamole. Breakfast was good. This was our 2nd stay. We were here a few months ago and had only stayed one night and realized there was so much more to see that we wanted to come back for a longer stay so we booked 2 nights. The hotel is beautiful and the staff is warm, welcoming, friendly and helpful! The rooms are nice sized with plenty of room for us to settle in, and the bathroom was nice and big as well. The restaurant's food was much better than I remember on our last trip, and there were some meals that they were also serving a buffet during our stay. The wait staff was wonderful and fun to talk with - in a few languages!!! It always amazes me when you meet people who can speak 3 or 4 or more languages! It helps if you speak Spanish, even a little! Not everyone speaks multuple languages but they have a great ordering system using a tablet to help describe the menu in different languages so you won't go hungry if you don't speak Spanish! The pool was nice and refreshing and the property is beautiful to wander around in. 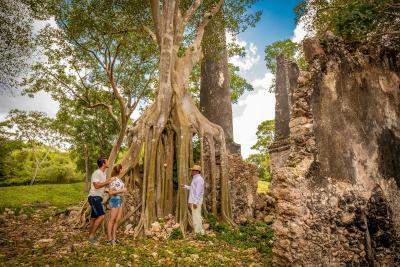 There is some great history to read about on the walls about both the Hacienda and the Uxmal Ruins and the explorers and archaeologists who were there. 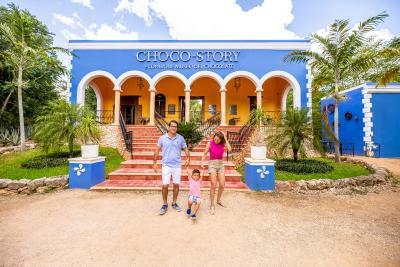 It's walking distance to the Uxmal ruins, the Chocolate Museum which was a lot bigger than we realized and well worth it. and the Planetarium! If you see the light show at night at the ruins - it's only in Spanish so please be sure to know spanish if you do go, but if you don't - it's still beautiful to sit up on the ruins and be there at night ! And Take time to drive Routa Puuc and See Santa Elena, Kabah, Syil, Labna, and the others... For Loltun - I'd recommend checking times and go first in the AM. It is about a 1 hour drive from the hotel (drive cautiously -aware of dogs, and birds, and iguanas, and kids and adults in the road!! as well as toppes!) Definitely worth the trip - Be aware you'll need to pay admission & for a guide!! They don't let you go in without one! Can’t think of anything I dislike about this hotel. Location is excellent for the ruins and the chocolate museum! Croissants are not croissants, there are some kind of doughy sweet breads! Very well situated near the arqueological site of Uxmal. Friendly and helpful staff. Delicious Margaritas cocktails. Good size clean swimming pool . Very comfortable room with good beds. NO freezing air conditioning. Good breakfast.